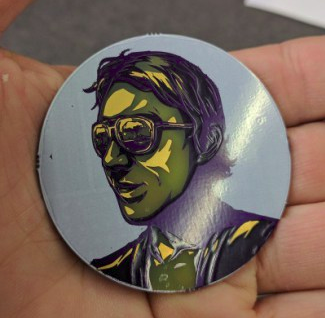 It was reported, and Hackaday has now confirmed, that counterfeit Benchoff Bucks were being circulated at this weekend’s Hackaday Superconference. The fake bills were distinguishable by their poor printing quality and vastly smaller size than official ‘Bucks. Their appearance should help to relieve the skyrocketing value of the Benchoff Buck, whose dominance as the preferred paper currency at hardware conferences has caused deflationary forces to take hold as ‘Bucks holders hoard them. Hackaday’s resident economists hope that the appearance of the counterfeits will begin to devalue the currency. Diminishing the strength of Benchoff Bucks has long been the goal for the portion of the Hackaday community who believe we need to move off of fiat Benchoff currency in favor of Benchoff-based cryptocurrency. We anticipate seeing the long-rumored ICO early in 2018, likely in conjunction with other live Hackaday events. No word yet on the name of the new cryptocoins, but it is worth mentioning that the ‘Benchoff Nickel‘ has already been taken. After an exhaustive investigation, the forger has been identified. They were given a pat on the back, a firm handshake, and charged with the responsibility of documenting the forgery effort as a Hackaday.io project. You know who you are… and we have our eye on you. Stay tuned for reports on other shenanigans that took place at the Hackaday Superconference over the weekend. In the meantime, you can check out some of the epic talks that were live-streamed as they happened. When can we start mining Benchoffcoin? What’s the smallest fraction of a Benchoffcoin called, a szczys? Will the mining difficulty start low enough to run on an Arduino? Only coins mined on 555-based computers will be accepted at first. Seed your PRNG with “NOTAHACK” and get mining. I’m surprised you didn’t go the “Bitchoffcoin” route. Did the world just end, have I/we been spiked with a hallucinogenic? This has got to be the most entertaining read (in the pure entertainment only category). Now 100 Benchoffs should be called a Benchamin (Benjamin Franklin and Brian Benchoff). Nice work incorporating the idea of Benchoff currency at the Superconference. That was not expected to materialize, yet a good surprise. Benchoff starts his own nation. Launch to commence in 3…2…1. So, do you have to declare Benchoff currency at TSA? But what’s the ratio of Benchoff Bucks to Szczys Nickles? Same as the ratio of unicorns to leprechauns. Oh, those home made ASICs have to be manufactured using the butterfly effect method… I’m sure there’s an XKCD for that. This reminds me of a joke I heard once; A man is admitted into a prison where the prisoners are kept for life. The prisoners cannot see eachother except for their cellmate. The new prisoner sits down on his bunk with his cellmate. He hears people calling out numbers and then loud guffaws following. He asks his cellmate who has been in the prison for 20ish years what is going on. He explains that the prisoners have been around so long, they associate jokes with a number. The new prisoner asks if he can try and calls out a resounding 14. There is silence. The man turns to his fellow prisoner and asks why didn’t anyone laugh? Wooden nickels do not have to be nickel plated to be legit. I was thinking of those wooden tokens that say “Good for…” that legitimately are applied for discount or a specific freebie. They are still called “wooden nickels” after the old counterfeits. Just had to check my calendar to make sure it isn’t April yet lol. There seems to be an “in-joke” I don’t know. What’s a Benchoff buck? I found an old HaD post talking about swag, and a benchoff nickle in FR4, but no details on what it’s all about? Salt, please? I haven’t finished my Benchonomics 300 level classes yet, but Earl Benchoff was a railroad magnate in the late 1800s (1890ish) who decided to connect all of the backwater lumber towns in order to compete with the riverboat trade on the Mississippi River. In his haste to chasten the oft-ill mannered backwoods folk, he instituted the Benchoff Buck, which was a sort of placeholding currency similar to those of previous mining communities. With constant product crossovers such as oatmeal with raisins or salted caramel, the revenue seemed endless. As with most of these chaste cultures, eventually fire water made it to town. In the next couple of decades, nearly 3/4ths of the communities had dissolved and people of the towns had torn up the iron and cross ties to sell off to the highest bidder. There is even one anecdote about Benchtown, where the residents re-directed the train tracks into a mountain cave. When the Lateral Lunger made its way around the bend and crashed into the cavernous hole, the drunk locals shot the survivors and spent the next week filling in the mouth of the cave to stave off the stench of the dead cattle that had been trapped in the cars. Some say you can still hear the braying of the cows on a quiet night while other folks reckon the cows formed their own subterranean society and built the world’s first non-milking machine out of the destroyed train parts. Benchoff Bucks were typically of the denominations “Half-Sawbuck” ($3.00), a “Cringey Joe” as it became known was worth about 50 cents, while a “Phineas Marque” was worth roughly 7.50 current USD and was primarily used for purchase of land and for large shipments of fire water. Variations of Benchoff Bucks were found by archaeologists in some river settling Native American tribe sites, suggesting that not only did the townsfolk trade with local natives, but that they had figured out how to copy the currency in order to bolster their own trade along the “Mighty Miss”. What started off as a bit of back-trolling (the trolling equivalent of back-chatting)… We won’t get too into details as that has passed since the whole Benchoff currency joke evolved/is-evolving into something positively serious by now. All in all it was an evolution of something with negativity into a good positive outcome, A Hack Within Itself (TM)! Holy crap someone forked the Benchoff. 3-D print your own from Thingiverse.